Special Projects Are We Ready? Part 1: Are We Ready? Or Not? 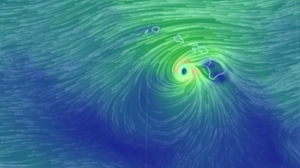 Civil Beat explores how vulnerable Hawaii’s most populous island is if a hurricane hits — and what’s being done to make us more prepared. The isolated islands would rapidly burn through food and supplies should the port close. Plan B is to bring limited goods through Pearl Harbor. Maintaining electricity in the wake of a major storm is also key to keeping the water supply flowing. The state is assessing the conditions of shelters and retrofitting some, but the work is expensive and slow. Congress has authorized $345 million to strengthen the aging canal to protect against flooding in Waikiki and nearby neighborhoods. 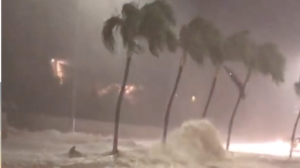 Hawaii has been hit directly by a hurricane or tropical storm five times since 1950. Three of those direct hits came in the last four years. The U.S. territory still hasn’t recovered from Maria. 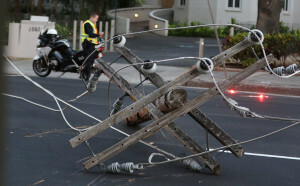 Hawaii officials hope better coordination and a more resilient electric grid will help avoid a similar fate. Read the entire “Are We Ready?” series here. In a direct hurricane strike, many of the systems vital to protecting residents and aiding Oahu’s recovery would be pushed to the brink. 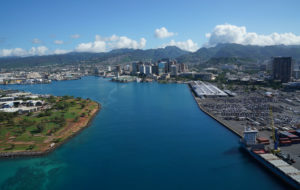 In urban Honolulu, all the large electrical, oil, water and wastewater facilities — as well as the port — are vulnerable to extreme flooding, according to a 2014 study co-authored by Karl Kim, a University of Hawaii professor and chair of the National Disaster Preparedness Training Center. 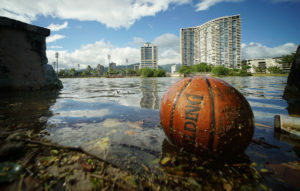 Half of Honolulu’s fire stations, hospitals and highway bridges would be susceptible to that flooding, too, the study found. And only Oahu has 127 emergency shelter locations — most of them public school buildings. Together, they provide enough space for about 20 percent of the island to take cover in a major storm. In a natural disaster, hospitals could see six times as many patients as normal. Hospitals can adjust by shifting medical workers around, as well as using hallways and emergency tents for overflow. A 2009 U.S. Army Corps of Engineers survey found, however, that about 35 percent of the state’s residents would seek emergency shelter outside their homes, even as a last resort. 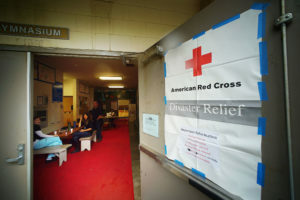 “There’s definitely a deficit in hurricane-shelter evacuation space,” says Jennifer Walter, preparedness branch chief for the Hawaii Emergency Management Agency. Further, it’s not clear how those shelters would actually fare in hurricane-force winds. Oahu’s shelters include 454 individual buildings, state documents show. Two dozen of them have been retrofitted to withstand at most a Category 1 hurricane. One building could withstand a Category 3 storm. The remaining buildings are believed to be able to withstand a tropical storm, at worst. 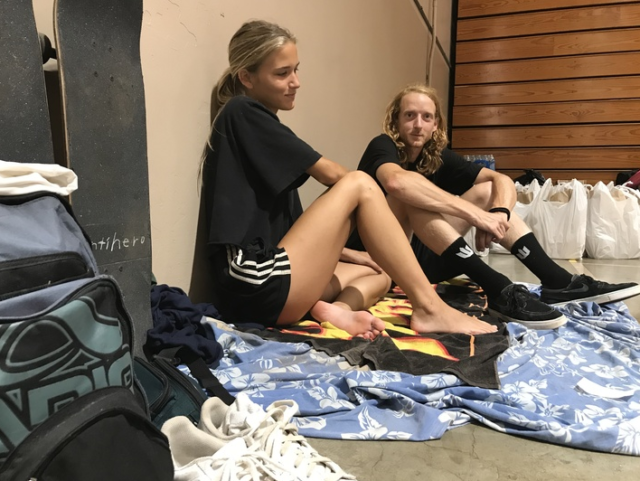 Francis Gagnon and Jessica Michaud were early residents at a McKinley High School shelter during the Hurricane Lane threat. Few Oahu’s shelters have been retrofitted to withstand hurricanes. It’s not clear how they’d do because the counties originally designated those buildings to be shelters using “visual assessments” and little more, according to a state report. Now, Walter and her colleagues are working to assess just how durable all of the designated shelters are. But the work, they say, is expensive and slow. 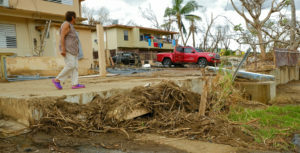 In 2006, after Hurricane Katrina battered the Gulf Coast, Hawaii state officials launched a new program to have structural engineers inspect whether the islands’ shelters met the latest, minimum hurricane guidelines. They wanted to gauge whether the buildings would actually withstand such a storm. Since then, the state has spent about $13 million gradually assessing and retrofitting emergency shelters, state documents show. Inspectors have assessed about 177 buildings out of nearly 700 statewide, according to Walter. Each assessment costs from $10,000 to $15,000, state officials say. 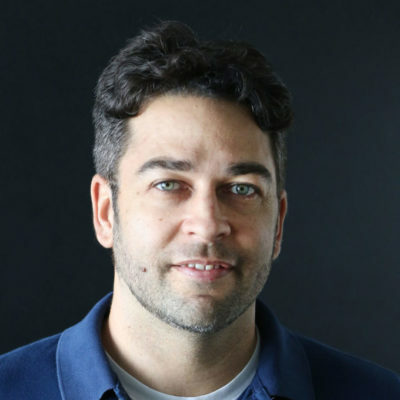 At the current rate, it would take 305 years to assess and retrofit all the shelters needed statewide — assuming Hawaii’s population stays the same, HI-EMA Critical Systems Planner David Lopez calculates. 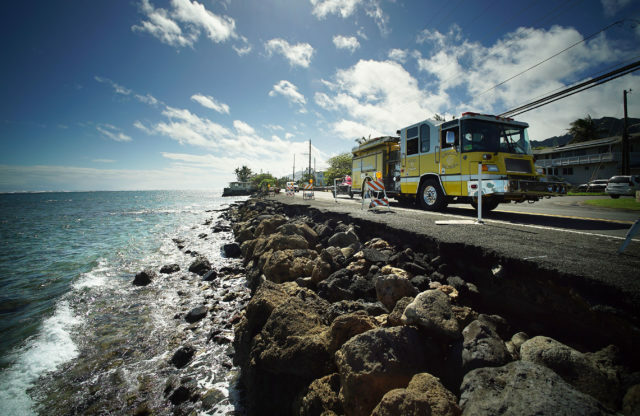 Many of Hawaii’s fire stations and other emergency services are located in areas vulnerable to severe flooding. That’s in contrast to Florida, which was hit by Hurricane Andrew in 1992 (the same year Hurricane Iniki struck Kauai) and, notably, has suffered several more direct hits in the years since. Florida’s emergency assessments only cost about $1,125 each because the surveys don’t require licensed engineers, emergency officials there say. Since 1999, that southeastern state has spent $40 million retrofitting some 1,150 shelter buildings — almost all of them at public schools and on college campuses, its emergency division reports. Hawaii, meanwhile, reports having retrofitted 50 shelter buildings. Florida’s push has left its evacuees with more nearby shelter options, and, according to the state’s emergency division, almost no shortage of shelter space. Walter said Hawaii building experts and public officials might soon revisit “what makes the most sense” locally — and whether the state might loosen its restrictions somewhat to allow more inspections similar to Florida. Hawaii’s shelters face other shortfalls, too. They have no emergency supplies and lack sufficient staffing, officials say. Walter stresses that despite all those issues the shelters are still the safer option for residents who live in areas prone to flooding, near steep ridge lines or in older homes with single-wall construction. Hawaii’s hospitals, meanwhile, can operate normally for three to four days after a disaster by pooling their resources together. Any longer and they’ll likely have to ration medical supplies and limit care, says Chris Crabtree, the Hawaii Healthcare Emergency Management director. The hospitals keep about a week’s supply of medicine and several days of backup power generation. On a normal day, Hawaii hospital beds are 85 percent to 90 percent full. The state is already dealing with a shortage of 751 physicians, including 384 on Oahu. In a Category 3 hurricane, emergency officials estimate hospitals could see six times as many patients seeking treatment, Lopez says. 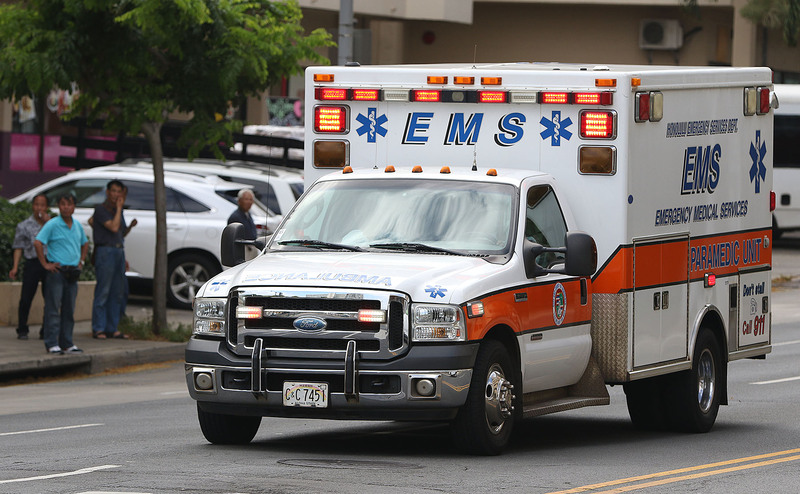 The demand is compounded by the fact that Oahu only has 18 full-time ambulances. Nonetheless, the state’s hospital network could adjust to work through the added load, Crabtree says. In a disaster it can shuffle doctors and nurses to where they’re most needed — assuming the roads and vehicles to get them there are available. Hospitals can make space using hallways, empty buildings and emergency tents. Patients who don’t absolutely need to be in beds can be discharged ahead of a storm. Oahu only has 18 full-time ambulances. 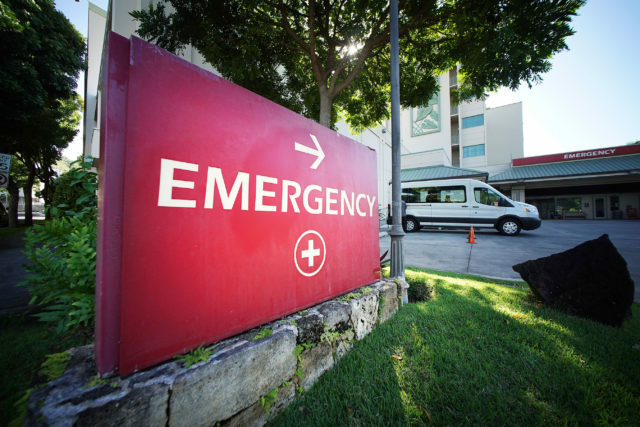 If things get bad enough, Hawaii hospitals can draw help from the Federal Emergnecy Management Agency’s pre-staged disaster medical assistance teams. And if things get really bad, patients can be flown to the mainland to make room in Hawaii. “There are a lot of things we can do. We are in a good way,” Crabtree says. “I’m never going to say we’re 100 percent” — there’s always more to learn, or unforeseen circumstances. Are We Ready? Or Not?